Great Circle earthworks; photo by Lisa Jacobs on Flickr (use permitted with attribution / no derivative works). The Newark Earthworks once covered more than four square miles and more than seven million cubic feet of earth were used in their construction (the largest complex of geometric earthen enclosures ever built). At present, only the Great Circle, the octagon and circle combination, and a small portion of the square are preserved on public land. 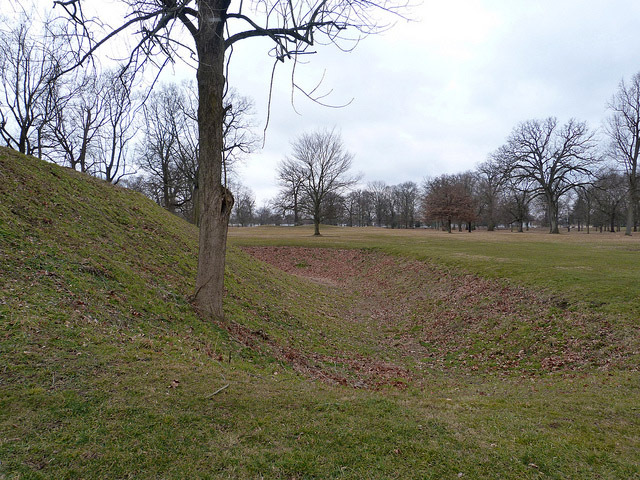 The Newark Earthworks were built about 2000 years ago by the people we now call the Hopewell. Giant geometric enclosures such as the Great Circle were centers for social, religious, and possibly economic interaction. Located in the center of the Great Circle is a series of small conjoined mounds, collectively referred to as Eagle Mound, which covers the remains of a large Hopewell house. It was not a dwelling, but rather an important social or religious gathering place. Excavations through the wall of the Great Circle indicate that it was built in three stages and that different colored soils were used in each stage. Originally, there was also a low outer wall which surrounded the Great Circle. Two segments of this outer wall are preserved at the eastern end of the park where they converged into parallel walls leading to the square. 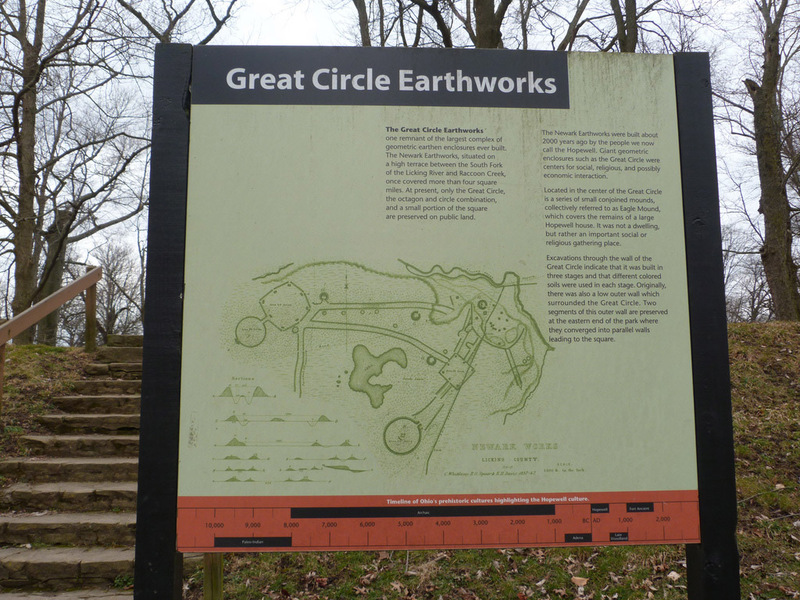 Sign describing the Great Circle Earthworks, Newark, Ohio; photo by Lisa Jacobs on Flickr (use permitted with attribution / no derivative works).